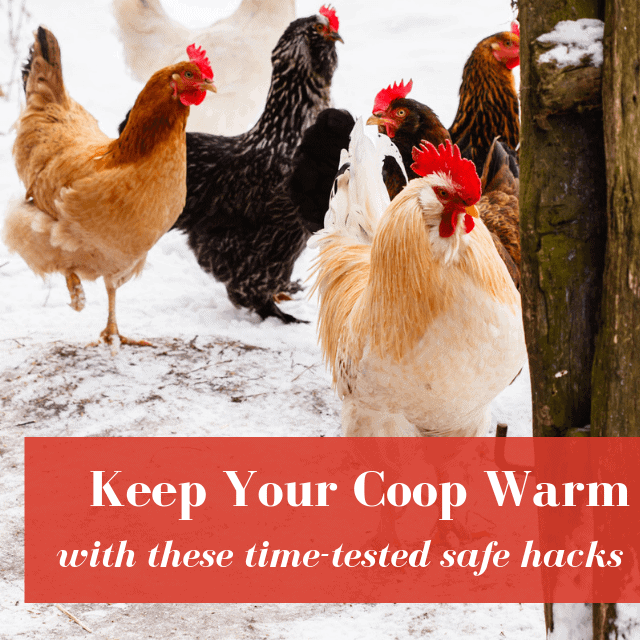 Not sure how to keep a chicken coop warm in winter? Then pull up a chair, because we got quite a few (battle-tested) ideas for you today. (Want to know how to keep your flock’s water from freezing? Get my genius hacks here). While the winters never get too brutal here in Missouri, we still do get our share of freezing temps (usually in January and February) thanks to the polar vortexes from our Canadian friends up North. And trying to keep a chicken coop warm in winter is never fun. In fact, it’s usually a battle of ingenuity, and we’re kept on our toes trying to find new ways to keep the flock toasty and cozy when it’s gotten so cold we don’t even have a prayer of getting the hose getting unfrozen. Now before we begin, just remember: For the most part, your chickens will be fine during the winter. Every year, I get a few people who ask whether their hens will freeze in temperatures below 40 degrees, and the answer is no. Your chickens will likely be fine no matter what. Only once temperatures dip below zero and into the VERY below zero temperatures (negative 30 degrees, for example) do you really need to be concerned about keeping them warm. In temperatures above zero, your chickens will fluff their feathers to stay warm and all the walking around and foraging will help keep their blood circulating and their body temperature up. At night, they’ll bundle together on a roost and keep their little legs warm by sitting on them. 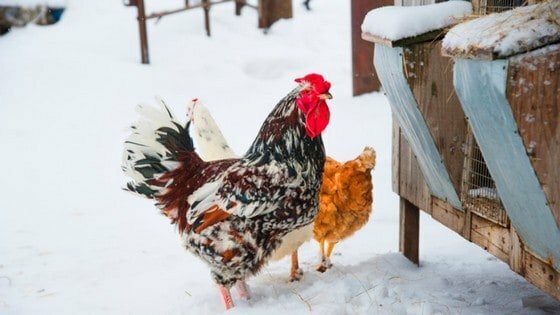 But you still are probably wondering how to keep a chicken coop warm in winter, so here’s some ideas we’ve used on our farm to get you started! We’ve had a lot of luck with the various coops on our property by using solar energy to keep the coops heated. Our coops have windows, so for the first part of the day, we can open the coop doors and let the hens forage. About mid-day, you can close the doors and allow the heat to get trapped inside the coop, keeping it warmer than it would be otherwise. Now, don’t ask me how many degrees this will raise the temperature – that’s going to depend on a wide variety of factors. And this won’t work 100% of the time. But it might be the difference between 22 degrees and 32 degrees in the coop – and that’s a heck of a difference. Straw is an amazing insulator – that’s why you see those straw houses becoming so popular. Putting about a foot deep of straw in your coop will do wonders keeping the cold air out and the warm air generated by your flock’s body heat in. As a bonus, your flock won’t have to stand on a cold floor. Now, you might hear that straw is not good to use as bedding – to each his own. Some people have decided that straw harbors mites, and the answer is if you don’t clean your coop, pretty much anything will harbor mites. Clean the straw out of your coop weekly, and you’ll be good to go. If you don’t know what the deep litter method is, or if you’ve heard of it but aren’t sure what it entails, then you can learn everything you want to know right here. Now for full disclosure, I don’t use the deep litter method. But people who DO use it claim it can raise the coop temperature by about 10 degrees – pretty significant when your talking about daily highs in the teens. The reason it generates so much heat is because the manure dropped by the chickens composts, and the breaking-down process causes heat. Like the deep litter method, this one isn’t going to be for everyone. If you’re not sure what a radiant heater is, you can see an example here (you can also buy one here). Now note, I didn’t say heat lamp – that’s a definite no-no because they get way too hot. Every winter, there’s a slew of posts on Facebook about people who used a heat lamp and their coop went up in flames. Just say no to heat lamps. Radiant heaters are a different thing – they don’t get so hot and have some safety features. They can raise the temperatures in your coop a few degrees, and that can make all the difference. Just note, you will need an electrical source to use a radiant space heater. Now, would I personally use one of these in my coop? Probably not. I’m WAY to paranoid about fires and our winters are not that cold – it’s the odd day that things get below zero. That being said, you might want to use one – and if you do, the more power to you. We have one horse pasture that I swear is 10 to 20 degrees warmer than the others. When the water is frozen solid in the other fields, it’s not even icy in this particular pasture. And the reason is that there’s a lot of trees causing a ginormous windbreak. And it makes all the difference. It’s pretty insane how much a treeline can keep a coop warm simply because it’s keeping the cold winds away from your flock. If your chickens are in a tractor, or if you can somehow move them behind a treeline, you’ll be able to keep the coop from losing warmth. If you can use something else to create a windbreak (moving the coop behind a structure so it’s protected), then that’ll work as well. Making sure your coop doors and windows have proper insulation will go a long way. If you’re trying to figure out how to heat a chicken coop in winter, then spend a little and get something like this that will do the job without taking the chance your flock will try to eat it. Please address my concern about insulating my small coop too tightly. I am in Pennsylvania. I read somewhere that we do Not want to seal up the coop because this will cause ammonia to build-up which is harmful; that, we need to keep good ventilation. If you clean your coop regularly and use a moisture absorber, you should be ok. If your hens go out during the day and the door is kept open during the day, then that’s sufficient ventilation. If your chickens stay cooped all the time or you’re not cleaning out the manure regularly, then you’ll need to worry about ammonia build up.